The survey is available until the end of July, and NYU’s Policing Project will compile the data to present to the NYPD. The questionnaire — which is available in English and Spanish right now, and will be available in six more languages, including Chinese and Haitian Creole, soon — asks respondents questions about when officers should wear cameras, if cops should tell people when the camera is on, if people can ask an officer to turn off the camera, and who can see the footage. 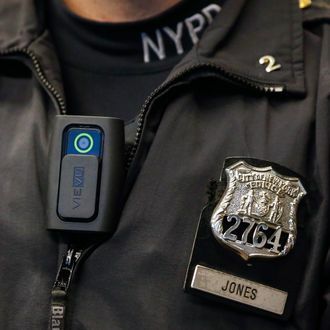 A handful of NYPD officers in three precincts are already wearing body cameras ahead of this more formalized policy. One of the biggest sticking points then, and now, is how long the cops will be required to keep these recordings, and what someone has to do to obtain them. In the current proposal, the NYPD says they’ll keep all recordings for at least six months, but longer in certain circumstances such as arrest (until the case is over) or use of force (three years), among other situations. To see these videos, the NYPD is proposing that members of the public apply through the Freedom of Information Act, unless an individual is accusing a particular officer of misconduct.